Charles Barkley is at it again. The outspoken NBA analyst, and former league MVP, was invited back to Auburn along with other prominent former Tiger players and coaches on Friday and Barkley spoke out against the NCAA while defending new Auburn head coach Bruce Pearl. “I thought he got screwed by the NCAA. He did not get a fair deal with the NCAA. I’m not a big NCAA fan as you can tell. What happened to him was really unfair,” Barkley said on Friday. Barkley was invited back to Auburn for the Moore’s Mill Club event by Pearl along with former Auburn head coaches Sonny Smith and Cliff Ellis — currently the head coach at Coastal Carolina. Former players also attended the event and Barkley appreciated that Pearl invited former coaches of the program to maintain support. The former forward also had kind words to say about Pearl and Barkley said he’ll continue to support the new head coach in whatever way that he can. Pearl noted that he had saved a complimentary voice mail from Barkley that he received seven years ago. 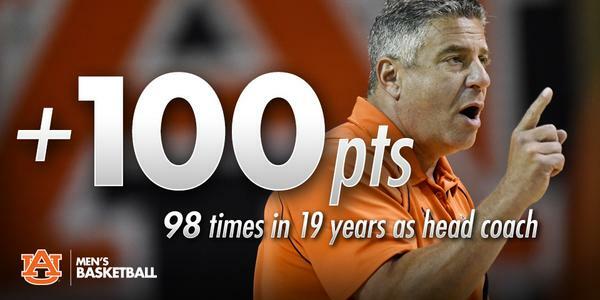 Right now, Bruce Pearl's life is exciting for one reason: everything is new. He's in a new town with new players, a new church and new synagogue. "New charities and new friends," Pearl said Monday. "A new staff and new players. Putting it all together." The first-year Auburn coach also knows how fast things can turn on a coach if he doesn't win quickly. He has seen it happen before and he knows why his first season on the Plains is important, with or without high expectations from the fan base. "I also believe it's important you have to have some success in the first few years," Pearl said. "I know everybody likes to talk about being patient, but there's momentum when you first get hired. I saw it at Tennessee in football: after a couple years, if you're not winning, the shine wears off the apple pretty quickly." time, there's a lot of work that still needs to be done," said Pearl, who inherits a team that finished with a 14-16 record in March. "One of my challenges is going to be the coaching aspect. I've been out for three years. The game has changed some. I've got to be able to make some adjustments. Just because what we did worked three or four years ago, doesn't mean that I don't have to make adjustments with our system to ensure it still works." Former Tennessee and current Auburn basketball coach Bruce Pearl told the Johnson City (Tenn.) Press that his return to Tennessee was never likely, but that he's still a "Vol for life" despite taking another job in the SEC. “I don’t think my being at Tennessee again was ever going to happen,” Pearl said Monday while in the Tri-Cities area for the opening of a new children's hospital. Pearl added that Donnie Tyndall was a "great choice" by Tennessee, though. "We had a great run at Tennessee," Pearl said. "We made so many wonderful friends that we now consider family. Tennessee is one of the top four or five programs in the SEC and Auburn is not. We have a lot of catching up to do." Bruce Pearl has assembled plenty of perimeter talent for his debut season at Auburn. In addition to K.T. Harrell, the SEC's sixth-leading scorer, and promising freshman point guard Tahj Shamsid-Deen, Pearl has added the nation's leading returning scorer in Antoine Mason, New Mexico State transfer K.C. Ross-Miller, along with freshmen swingmen T.J. Lang and Sam Logwood. Pearl faces more question marks inside. Although the Tigers did sign the nation's No. 1 junior college prospect in power forward Cinmeon Bowers, the rest of the post presence will have to come from a returning roster that struggled to find production outside of departed center Asauhn Dixon-Tatum and departed senior swingman Allen Payne last season. His stable includes a lot of players who have a lot to prove. Three returners -- a pair of 6-8 forwards Jordon Granger and Alex Thompson, plus 6-foot-9 center Matthew Atewe -- who averaged fewer than two points last season, and only Atewe, at 3.4, averaged more than two rebounds. Pearl will need some minutes from those players, who all have a transition to make to play in Pearl's pressing, full-court system. A system that could fit Granger, a lanky junior, perfectly. "Jordon, defensively, could probably play the 2, 3 or 4," Pearl said in an interview on ESPN Auburn-Opelika Tuesday. "He's very quick, he's very athletic, improved his range. Jordon's worked really hard, he's become a great leader for me." Granger played 10-12 minutes per game last season. Chris Loften, 1of the hardest working, most dedicated competitors I've ever coached. #outlive @Vol_Hoops @AuburnMBB !http://m.maysville-online.com/sports/basketball/hard-work-pays-off-for-lofton-in-hall-of-fame/article_f31ace6b-3599-5fee-ade1-85958013929c.html?mobile_touch=true …. Nov. 7: West Alabama (exhibition), 8:30 p.m.
Nov. 21: Louisiana Lafayette, 7 p.m.
Dec. 5: Coastal Carolina, 7 p.m.
Dec. 17: Winthrop, 7 p.m.
Dec. 20: Xavier, 7 p.m.
Dec. 29: Middle Tennessee, 7 p.m.
Jan. 3: North Alabama, 4 p.m.
"Recruiting has gone pretty well without me," but Bruce Pearl says he's ready to work at midnight Aug. 24, when show-cause penalty ends. Former Auburn signee Sam Logwood has committed to New Mexico, sources told ESPN. "As much as you all think I'm P.T. Barnum, the truth of the matter is in October, I want to chain the doors. I want to lock them," Pearl said. "I don't want anybody, and I want to see if we can guard somebody and if we can have a few positions without turning it over, if we can try to find a way to play and honor the game." "Let's try to get March Madness before we have some Midnight Madness," Pearl said. Pearl arrived at Auburn and immediately strengthened the Tigers' non-conference schedule. The goal is the postseason, and getting there will rely heavily on the Tigers' standing in the Ratings Percentage Index. Auburn's season opener against Wisconsin-Milwaukee will tip off at 9 p.m. on ESPNU. 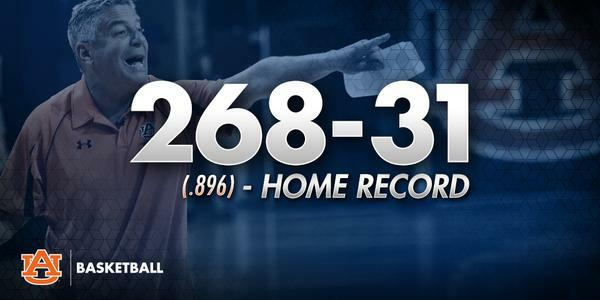 The Nov. 14 tip against Pearl's former team is the first season opener in Auburn history to be televised nationally. So Bruce Pearl just got another top 100 basketball player at Auburn. This is unreal. Auburn has announced Ronald Delph and Alex Thompson "have taken an indefinite leave of absence" from the basketball team. RE LRT: He's talking about Bruce Pearl and Auburn. Pearl now has talent for 2015-16: Kareem Canty, TJ Dunans, Daniel Purifoy, Horace Spencer, Cinmeon Bowers, Trayvon Reed. Needs a 2-guard. Whether Rice should get a second chance was another question on the show. "For me as a coach and myself, who lied to the NCAA and didn't tell the truth, and had a three-year show-cause (suspension) for making the mistake of a lifetime -- something I own and am embarrassed about -- I'm grateful that I was given a little bit of grace and I'm grateful that I was given a second chance," Pearl said. "This is tougher. Tougher." "I have had in my career a couple guys that had an enlarged heart and prior to an episode I denied them the opportunity to play basketball. I kept them on scholarship but wouldn't let them play. So, I've been in that situation before with an enlarged heart and not let them play. I felt the risk was too great." A replay of Pearl's appearance on "Jim Rome on Showtime" is next scheduled to air Thursday at 9 p.m. CT.
How will they remember BP? "A couple days ago at practice, I think somebody may have missed a foul shot... I don't really know what happened, somebody might not have been sprinting hard," KT Harrell said. "(Pearl) takes off his shirt, and starts yelling and screaming. "I'm thinking in my mind.. put your shirt back on. He threw it on the ground and was yelling. But that's just how passionate he is." Of course, this isn't the first time Pearl has bared his chest. T Harrell grew up in Montgomery, only an hour away from Auburn. Tahj Shamsid-Deen, an Atlanta native, wasn't much further away than Harrell. Neither player remembers much about Auburn basketball. 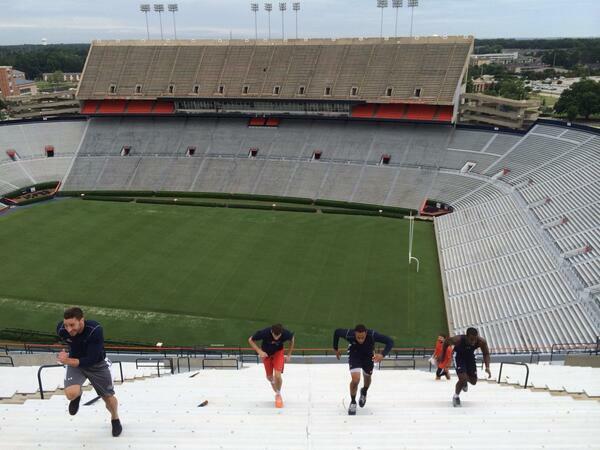 Harrell and Shamsid-Deen knew Charles Barkley had played on the Plains. That was about it. "Since Coach Pearl's been here, there's been a big buzz, like we're the football team or something," Shamsid-Deen said. "You're not supposed to really listen to what media say or what we hear on TV, but we see it, and we hear it." The arrival of head coach Bruce Pearl has raised anticipation surrounding the start of Auburn's basketball season to a level the Tigers haven't seen in more than a decade. When Pearl stepped into the interview room at Auburn Arena for the Tigers' media day on Tuesday, he couldn't help but smile and crack a few jokes at a room filled with at least 25 members of the media. In the past, a preseason basketball interview might net enough reporters to count on one hand. "I think there is a lot of hope and excitement and energy," Pearl said. "Just look at the season-ticket numbers. We sold 2,100 last year and we've sold over 5,000 already this year." 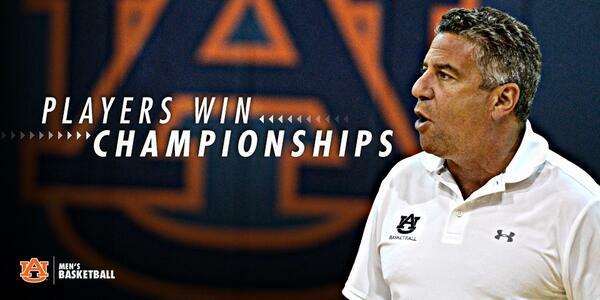 There is not a basketball coach out there I have less respect for than Bruce Pearl. I have always disliked Auburn in football. Now I can do the same in basketball. Hope they lose every game. The guy is a cheater and runs a loose ship. But I love having characters in the game. Probably invited by the Professor to make a point about "branding" which is what the lecture appeared to be about.